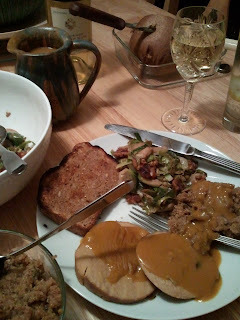 While I understand and respect the various objections to Thanksgiving, for me it is an excuse to cook and to eat particular kinds of foods, always with copious amounts of gravy. This year, I had a nice, quiet day at home with my Tofurky. I was so pleased with how everything turned out that I decided to post it here, after my long hiatus from blogging. I'll do my best to reproduce the recipes here, but keep in mind that I made them up as I went along, and so amounts are my best guesses. This is for the small Tofurky roast (not the whole dinner package). Remove the Tofurky from its plastic wrapping and place it in a casserole pan with a lid with large pieces of veggies (some combination of carrots, celery, onions, mushrooms). Mix 1 cup of veggie broth (I use Better than Bouillon) with 2 tablespoons soy sauce and 2 tablespoons chopped garlic (and/or the liquid from chopped garlic in a jar). Pour this mixture over the roast and veggies. Bake in 350-degree oven for 1-1/4 hours. Remove from oven, rotate roast 180 degrees and stir veggies, and return to oven for 10-15 more minutes. Use the liquid to make a gravy. Melt 1/2-1 tablespoon Earth Balance in a small saucepan and add a tablespoon or two of flour to mix. Add the basting liquid (and some blended veggies if you wish) to the pan, stir, and bring to a boil. 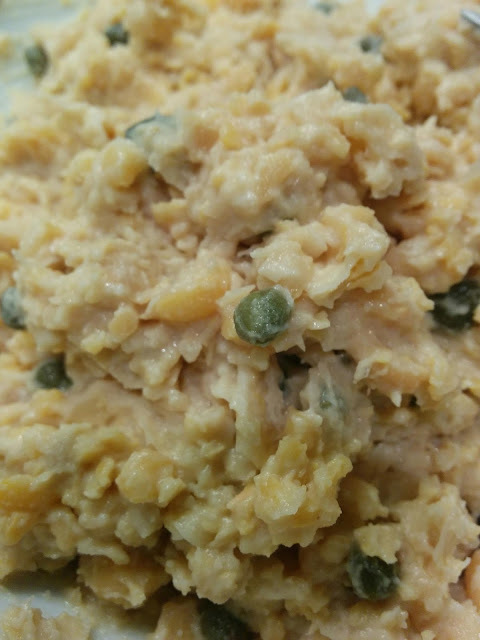 Stir in a tablespoon or two of nutritional yeast. Simmer to desired consistency and/or add a tablespoon or two of cornstarch-cold-water mixture to thicken. In a medium saucepan, brown garlic in olive oil and add mushrooms. 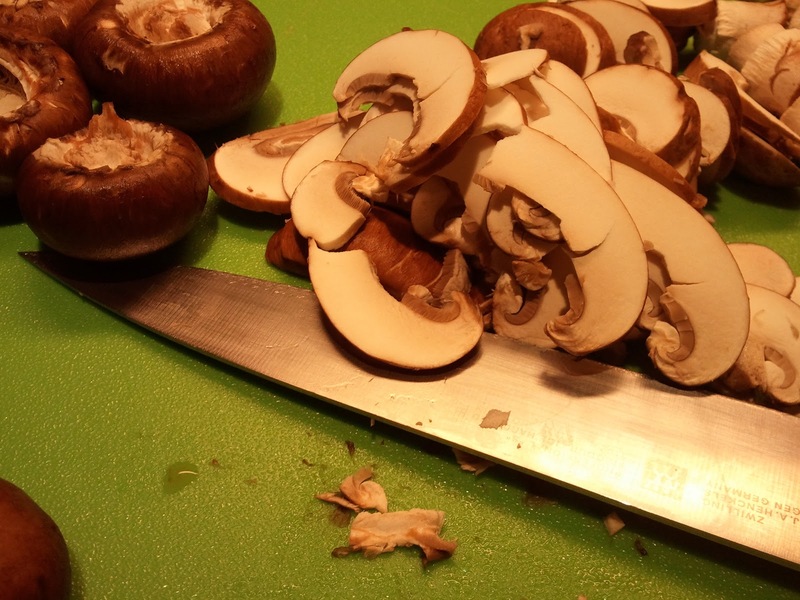 Cook on medium-high until mushrooms are tender, stirring constantly. Add quinoa and stir for one minute. Add broth and stir. Reduce heat and cover. 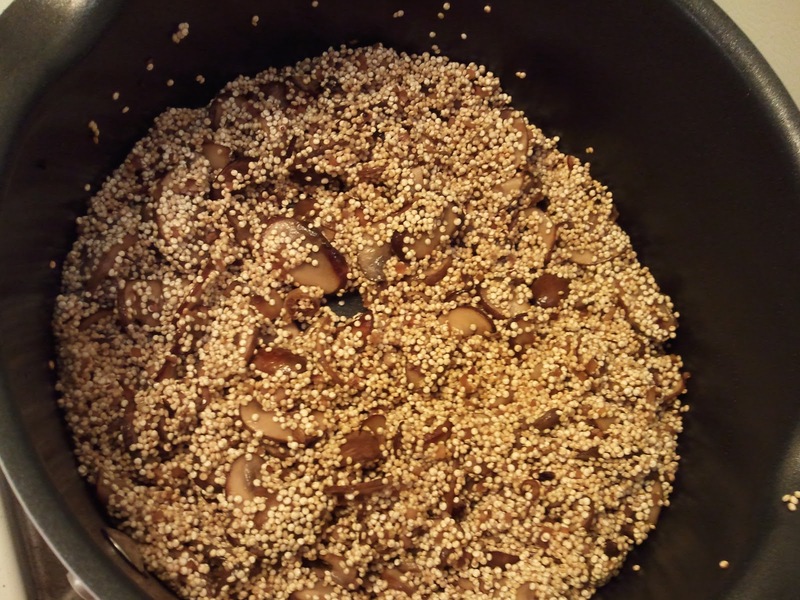 Check every five minutes, adding water if necessary, until quinoa is fully cooked. I added about a half cup of hot water about three times. Add spices to taste. Can be made a day ahead. 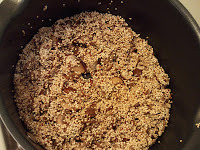 Melt Earth Balance in frying pan or wok and add walnuts; stir over medium-high heat until browned. 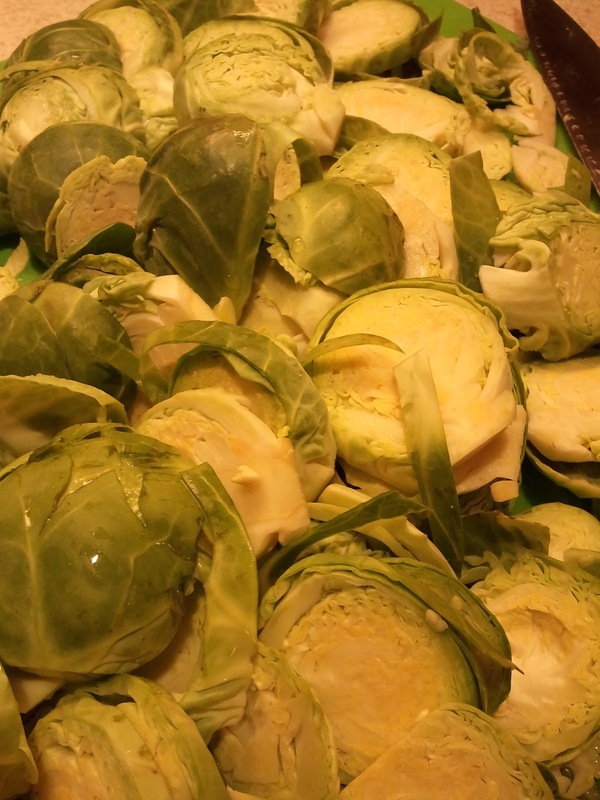 Add Brussels sprouts, sprinkle salt over all, and stir fry over high heat for a few minutes, until browned. Add white wine and cover for 30 seconds. Then lift cover and stir until liquid evaporates. Serve immediately. 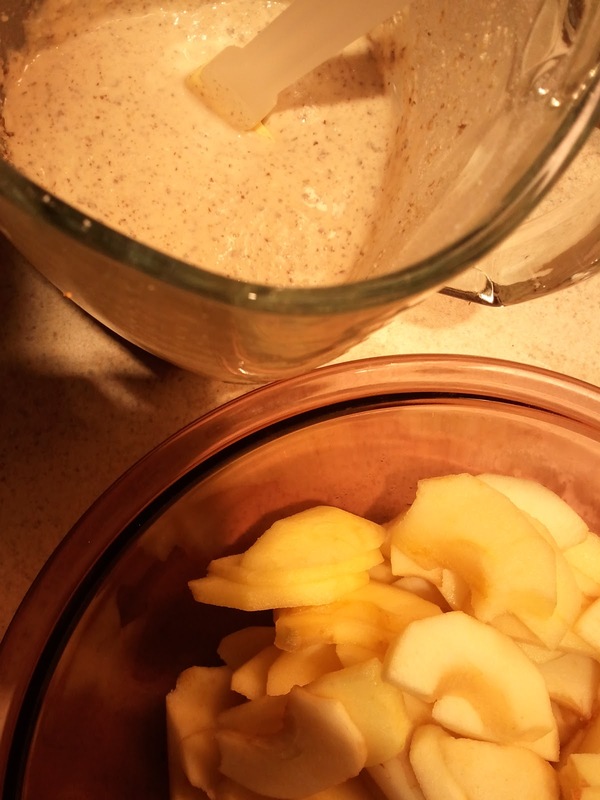 Blend all of this together until it forms a very thick liquid. Mix together with pastry blender, two butter knives, or (my preference) your hands, until it's a coarse crumble. Mix apples with "custard" and fill pie crust with this mixture. Add crumb topping and bake at 350 F for one hour or so, until crust and topping are golden brown. 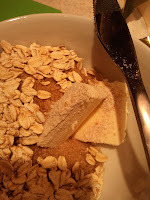 Best served warm with vanilla frozen dessert (here shown with Rice Dream). I want to be invited over for non-thanksgiving dinner every year from now on. I first had "chuna" salad last summer at O2 Vegan Cafe in Cambridge and found that it filled an old craving. It's an easy, quick, and filling vegan alternative that works in sandwiches, on salads, or just on its own. I developed this recipe on my own from trial and error, but you can easily include your favorite additions. Mix first five ingredients in large bowl, mashing the chick peas with a fork until it forms a coarse mixture, leaving small bean chunks. (It requires a little effort to do it by hand, but I've found the results much more satisfying than the paste produced by a food processor.) Then lightly mix in the capers. Growing up, The Joy of Cooking was my family's go-to cookbook. My mother gave me a brand-new copy when I moved into my first apartment. I haven't used it much in recent years, as it's not terribly vegan-friendly, but I still refer to it occasionally for "standard" recipes that I can modify. I love waffles, and I never was quite satisfied with the vegan ones I was making. 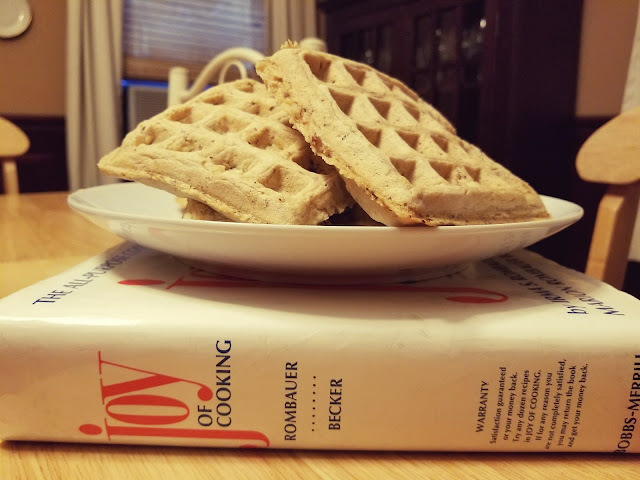 Worse, it is a family tradition to eat waffles on Christmas morning, and mine are always shunned in favor of the egg-and-butter variety my brother makes. When I splurged on a new waffle maker this year, I decided to figure out the secret to the perfect waffle. So I turned to the Joy of Cooking. You know when you have a lot left over from your farm share, you're due to pick up the next one, and you have a chocolate craving? What? It happens to me all the time. This is what came out of that last combination of circumstances night. 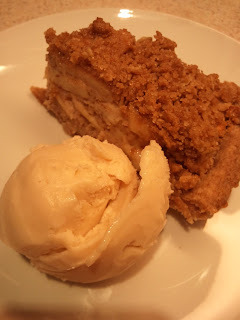 I was not intending to turn this into a blog post, and so I apologize for the paltry poor quality photos. 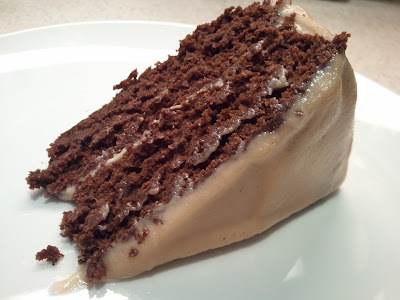 With modifications, the recipe for the cake recipe was drawn from one on Yummly, the frosting from a recipe on Nouveau Raw. Anthropologist, social worker, urban gardener, traveler, knitter. I love to make and eat food, and I follow a plant-based diet.